A sad story. This traditional hut burned in 2010. 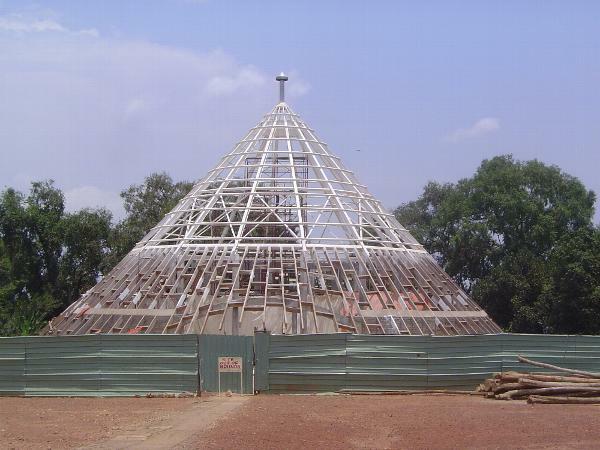 It was no ordinary hut: at Kasubi, it housed the tombs of four Baganda kabakas or kings. It was, and is, a UNESCO World Heritage Site, but it's being rebuilt with a steel frame coated with fireproof paint. Not very authentic, but it replaces a hut that was built in 1938 with concrete poles. An earlier hut had been built in 1882 by the 35th kabaka, and it replaced one from 1820, so perhaps we shouldn't expect these buildings to last for centuries--or to expect even this one to resist fire. Guides on the spot have no hesitation in assigning blame for this fire. They say it was the work of the same Somali group responsible for suicide bombings in Kampala that year.